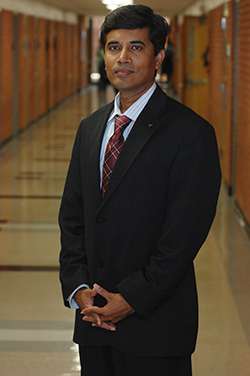 Lamar University professor Dr. Kumer Das, director of the Office of Undergraduate Research, has been selected as a 2019 Texas State University System (TSUS) Chancellor’s Faculty Fellow. The award will allow Das to continue his mission to cultivate a culture of undergraduate research on the campuses of Texas State University System. The TSUS Chancellor’s Faculty Fellowship Program is granted annually to a select number of faculty members interested in taking on a leadership role in the system. The program both empowers educators to stimulate improvements in current or emerging academic areas and provide an opportunity for faculty to gain experience at the system level and build a network of academic leaders across the system. In his proposal, Das laid out a number of projects that work together to engage student success through undergraduate research, data analytics and leadership development. These programs target retention, faculty development and initiatives to encourage undergraduates to take part in research and creative activity, while at Lamar University and after graduation. The proposal included the possibility of a system-wide, two-semester program for TSUS mid-career faculty and staff who aspire to broadened academic, professional or administrative roles, a big picture analysis of TSUS retention data to better understand the scope of the attrition issue and initiatives to improve or establish undergraduate research programs in all TSUS institutions. In his time at Lamar University, Das has published technical and pedagogical articles in prestigious, refereed mathematics, computer science, statistics and educational journals and involved undergraduate and graduate students in his research. He has also been awarded more than $2.5 million in external funding for his research and outreach activities in the past thirteen years. He has served in many positions at LU, such as the Director of Undergraduate Research and Interim Associate Provost for Research. Das is currently a Fellow of the American Council of Education (ACE) at the University of Louisiana at Lafayette. He is among 43 ACE Fellows who are shadowing university leaders nationwide during the 2018-19 academic year. Das earned his Bachelor of Science in Statistics with a minor in mathematics and economics from the University of Dhaka in 1996. It is also there he went on to earn a master’s degree in statistics in 1998 and in 2005 he earned his doctorate in mathematics from Auburn University in Alabama. That same year Das came to Lamar University as an assistant professor, moving to a position as associate professor in 2011. In 2013, he founded the Office of Undergraduate Research and has worked as its director since. He is currently a professor in the Department of Mathematics.